Data plays a critical role in the success or failure of B2B lead generation strategies and marketing/sales campaigns. Let’s first understand one fundamental point – whether your main source of leads is through inbound or outbound marketing, we can all agree that we want to attract the right kind of audience. In marketing or sales, for lead generation, you need to ensure that you’re using the right content, through the right medium and at the right time. While I am not suggesting that you work on reinventing the wheel, it is nevertheless true that without the right data, your efforts will always go wasted. The main point here is that “globalization” is playing its role in helping us in becoming better and better at sales and marketing. In the meantime, modern entrepreneurs and trendsetters work hard and smart on becoming wolves amongst sheep. Rest assured, nowadays B2B data can certainly help you get that competitive edge. But which kind of data is the question you need to ask yourself? Truth is that Augmented B2B data is a growing need. It’s also important to note that at this moment despite all the hype we see revolving around artificial intelligence, the requirement for human verified B2B data is ever-existent because seeing is believing. Lead generation can get difficult when you are unsure about your account information. This leads us to understand why account-based marketing is so successful. When we focus on a particular account, we have a better chance of delivering and achieving customer success. It’s safe to say that if more companies knew what you were selling and what your value offering is they would definitely consider your product if not purchase from you. This doesn’t mean targeting everyone you believe might be your customer. Your lead generation needs to be super-focused and for that, you must have a targeted ideal customer profile and multiple buyer personas. 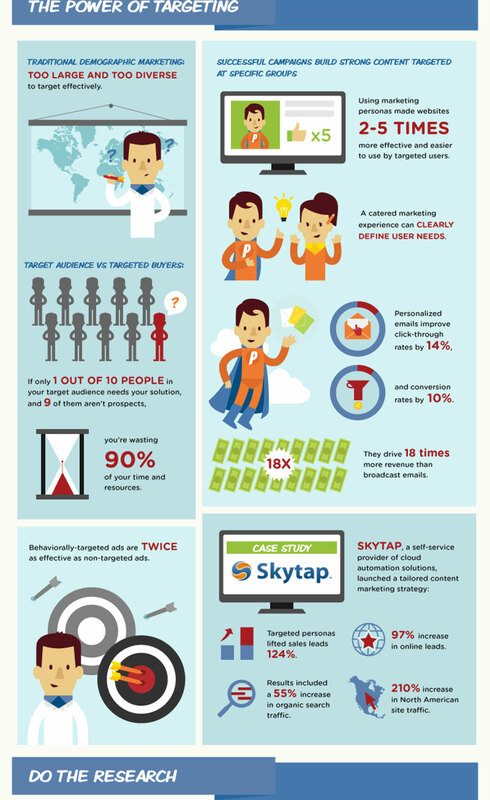 Here is an amazing infographic on how you can target effectively. There is no harm in experimenting in order to understand who you should target as a part of your B2B lead generation strategies. However, you should always be fair with your approach and respect your prospect. Or you may as well be lead exterminating. The problem with outbound sales is that if you do not have a proper strategy, you will lose more than you will gain. You could simply call this lead extermination because you are not only losing a prospect, but your brand image and overall perception are also negatively affected. Think of it this way – would you appreciate a cold caller who did his homework or another one who just has a scripted approach and limited information about you? If you are leaning towards the former than it’s not just you, it’s everyone. When bad data can cost only the U.S. a staggering $3 trillion per year then you can bet that bad B2B sales data and affected businesses intrinsic value play a factor in all of this. Lead generation is an information game. The company that has more accurate, verified and up-to-date data is the winner because more information equals a better sales pitch, which in turn yields greater lead conversions. 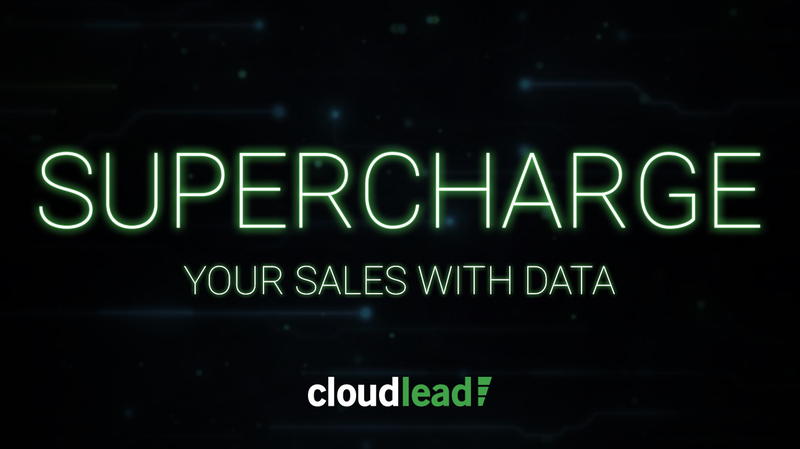 Hence, the way to supercharging your B2B lead generation strategies is by utilizing the right kind of data. Know What Kind of Data You Need? The question that arises from all of this commotion is to know what B2B data is necessary for your lead generation needs. Knowing who your customer is the most important thing you can do for achieving your business goals. Now all you need to know is how to find your ideal customer. The sales funnel is an important concept for considering your various marketing and sales activities. However, your top of the funnel data will be key in affecting your conversion rates. The logic here is that your sales funnel reaches a sustainable point when you are attracting the right audience. This fact is universal regardless of whether you are using inbound or outbound marketing for lead generation. In outbound marketing, the company gets the chance to choose who to target and through which medium. This is why data would matter that much more. If you are unsure about how you can get your B2B data, you needn’t worry too much. Thankfully you can find B2B data specialists who need only the criteria you require for targeting the right prospects. You don’t need to learn or teach your employees another software for lead generation and worry about invalid data. Surprisingly invalid data can cost you a lot of business. It may be true that you need to refine your outbound efforts in order to reduce your chances of getting bounced emails. When you rectify problems from your end by having a spam-free and professional outbound approach. You will find that quality and relevant data will be your halo ring. Test And Implement What Works! One thing that you can understand from all of this is that A/B testing is vital for learning what works with your customer profile. Writing a killer email that is key to maximizing ROI is what you should be opting for. If A/B testing is done right, trust us that you can make millions just by writing personal and well-tailored emails. Try some subject lines that earned people up to $4million! You can be sure that the material is out there and so is the data, therefore, prioritize your campaigns align your objectives and initiate your next million dollar outbound strategy as soon as possible. You can complete step one for free right here to start building a sustainable sales pipeline for your company or venture. Lead generation is not a complex process if you have your foundations in place. It can, however, be made complex by not thinking through your data and executing strategy. B2B lead generation shouldn’t be a question, it should be an answer to your business problems. B2B marketeers often find themselves in a fix when surrounded by a lot of irrelevant information. The crux of the matter is that information is usually the basis for all decisions. When we get B2B leads other than engaging with them you need to keep accountability of what medium is working. From the graph below you can see a category listed as “other”. It seems that marketeers are unsure about what is working for them and what is not. Knowing your lead source is essential. 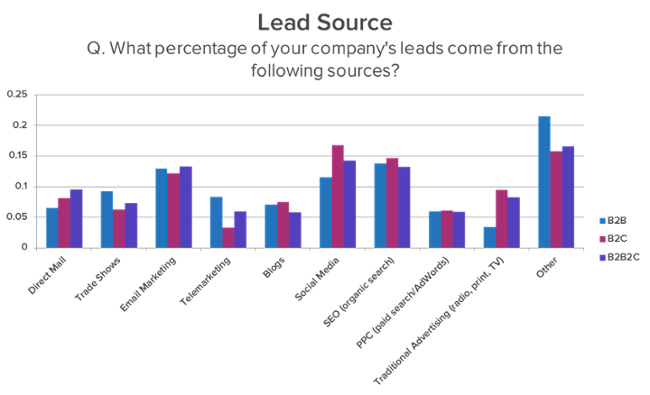 What would further facilitate this graph is to know the stats of outbound and inbound marketing leads source. However, like we mentioned before, in outbound marketing, you choose who to target and which medium to use. Therefore, it seems pretty obvious what the answers will be to that question. Whatever you choose to do for your B2B lead generation strategy, keep experimenting in order to know what works best. Try some new tactics mentioned here and integrate a custom B2B data plan to get started today. If you still need advice on what works, feel free to contact us here for more information or email us at hello@cloudlead.co.